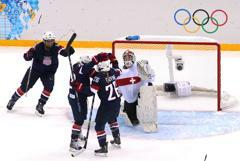 SOCHI, Russia -- Six players scored and 13 skaters recorded at least one point to help the U.S. Olympic Women's Ice Hockey Team beat Switzerland, 9-0, today in its second preliminary round game of the 2014 Olympic Winter Games at Shayba Arena. With the win, Team USA guarantees itself a spot in a semifinal on Monday (Feb. 17). After back-and-forth action in the opening minutes of the first period, Team USA scored five goals in a 6:22 span midway through the frame to break the game open. Monique Lamoureux (Grand Forks, N.D.) started the record-breaking scoring outburst at 9:20 when she took a pass from behind the net and slipped a shot through Swiss goaltender Florence Schelling's five-hole. Brianna Decker (Dousman, Wis.) doubled the U.S. lead just 47 seconds later by converting on a rebound at the edge of the crease. Then, eight seconds after Decker's goal, Amanda Kessel (Madison, Wis.) flew down the far-side boards, cut to the slot and scored on a low wrist shot to give Team USA a 3-0 edge. Hilary Knight (Sun Valley, Idaho) made it 4-0 when she batted home a loose puck at 14:23 before Kessel one-timed a Decker pass under Schelling's blocker for a power-play marker at 15:42 to give the United States a 5-0 advantage after the first frame. The U.S. pushed its lead to 6-0 at 13:26 of the middle stanza when Lamoureux netted her second of the game with a quick shot from the bottom of the right circle that found its way between Schelling's glove and body. Kendall Coyne (Palos Heights, Ill.) made it 7-0 just 49 seconds into the third period. After skating to the front of the net, Coyne batted away at a loose puck until it trickled through Schelling and over the goal line. Then, at 3:59, Coyne found the back of the net again, this time sliding a rebound through Schelling's five-hole to give Team USA an 8-0 lead. Alex Carpenter (North Reading, Mass.) connected on a breakaway at 15:39 to close the scoring. Coyne and Kessel both finished the contest with four points. Kelli Stack (Brooklyn Heights, Ohio), Jocelyne Lamoureux (Grand Forks, N.D.), Decker and Knight all recorded multi-point games. Goaltender Molly Schaus (Natick, Mass.) recorded 10 saves for the shutout. 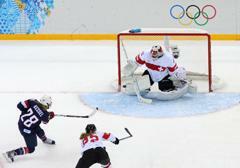 The U.S. Olympic Women's Ice Hockey Team will conclude group play Wednesday (Feb. 12) when it squares off with Canada. Puck-drop is scheduled for 7:30 a.m. ET and can be viewed live on NBC Sports Network. NOTES: Team USA broke an Olympic record by scoring three goals in 55 seconds in the opening stanza ... Also, the U.S. set a team record for fastest five goals in an Olympic contest, scoring five times over a 6:22 span in the first period ... The U.S. was 1-for-4 on the power play and was 2-for-2 on the penalty kill ... 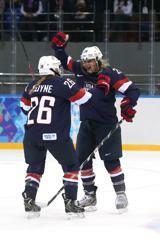 Through two games, Kendall Coyne, Amanda Kessel and Hilary Knight are tied for the U.S. points lead (4) ... The U.S. Olympic Women's Ice Hockey Team has medaled in all four Olympic appearances to date (gold-1998, silver-2002 and 2010, bronze-2006) ... The 2014 U.S. Olympic Women's Ice Hockey Team is under the direction of General Manager Reagan Carey (Colorado Springs, Colo.) ... Katey Stone (Arlington, Mass.) was named head coach on June 8, 2012, and is the first female to serve as head coach of a U.S. Olympic Women's Ice Hockey Team ... USA Hockey's international council, chaired by Gavin Regan (Potsdam, N.Y.), vice president of USA Hockey, has oversight responsibilities for all U.S. Olympic Teams.